PASSION FLOWER: Passion flowers are exotic looking topical plants that can actually be grown in much milder areas. There are many different passion flower plants. Some passion flowers are vines, some produce edible fruits. The genus Passiflora contains over 400 species. The name 'Passion' Flower comes from Spanish Christian missionaries who adopted the unique physical structures of this plant, particularly the numbers of its various flower parts, as symbols of the last days of Jesus and especially his crucifixion. 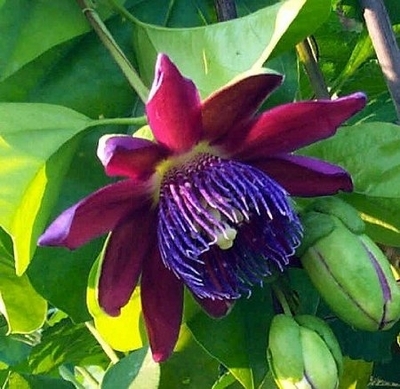 Passiflora alata 'Ruby Glow' (Passion Vine) - This South American vine explodes with blooms. Its flowers are huge - 5" across - an intense dark maroon, and give off an hypnotic nutmeg-musky scent. It has rounded , thick, leathery rich green leaves. 'Ruby Glow' can produce fruit if cross-pollinated. It loves the sun, but can take some shade, flourishing with average watering. It can frost down, but resprouts quickly. This plant has been grown for many years as Passiflora alata 'Ruby Glow' but more recently been identified as a species, Passiflora phoenicea, a close relative to P. alata that grows naturally in eastern Peru. Grows to 1-3 in container, vining in habit, minimun temperature indoors 50°, blooms in summer and fall.